These last two weeks have been nuts both at work and at home. I have actually had to set time aside to get reviews done, creating a kinda schedule if you will. Before I just knocked them out as I had time. Anywho, this week’s review is one that I have been meaning to get to for quite some time. CAO’s La Traviata Maduro. 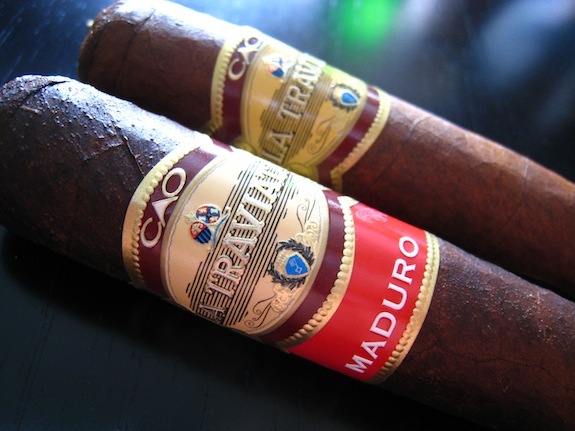 I was a huge fan of CAO’s La Traviata and I think I can speak with most people in saying that the maduro version has been at the tip-top of my “wants” list since I have heard it was in production. This particular stick that I am reviewing was given to my by my good friend Adam over at Tobacco Rd. The Good Stuff: CAO was one of the first manufacturer’s that I can remember that equalized the economic downfall with a top of the line, affordable cigar that not only played friends with customer’s wallets, but blew the doors off unnamed cigar rating projects when the Natural version failed to show face in last year’s best of the best. 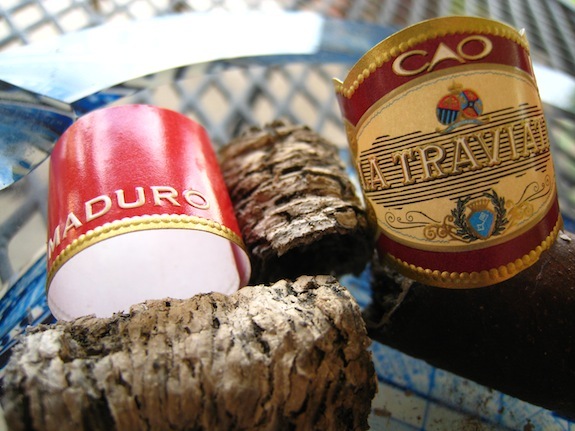 CAO’s La Traviata Maduro is composed of Nicaraguan and Dominican tobaccos, bound with a Cameroon, then wrapped with a Maduro Connecticut Broadleaf wrapper. These bad boys should be hitting shelves as you are reading this review, and from my guess would retail around the same price as it’s natural brother, around $6 a stick. 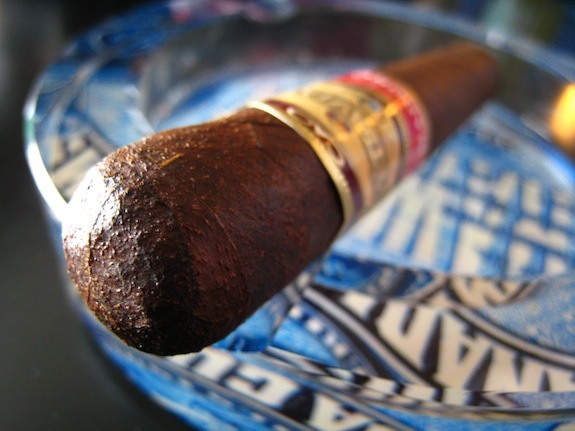 Prelight: The La Traviata Maduro is an extremely dark complected cigar. The Natural La Traviata carried a darker brown but it can’t even hold a candle to the dark chocolate color of the Maduro. The wrapper is extremely toothy with tons of larger bumps making face. Much like the La Traviata Natural the Maduro’s oils make the cigar almost look like it was sprayed with a clear coat of protectant. 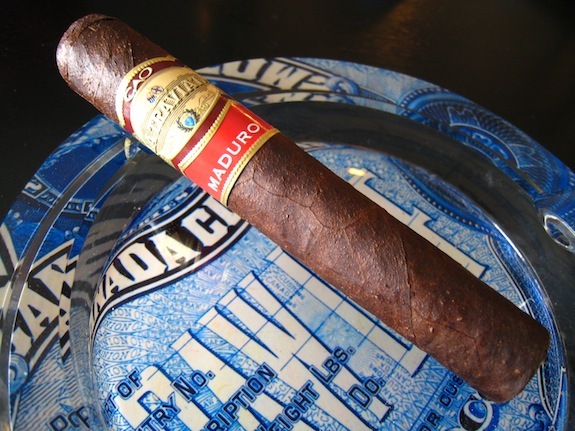 The Traviata Maduro is an extremely firm cigar. It’s almost hard and feels very tightly packed. 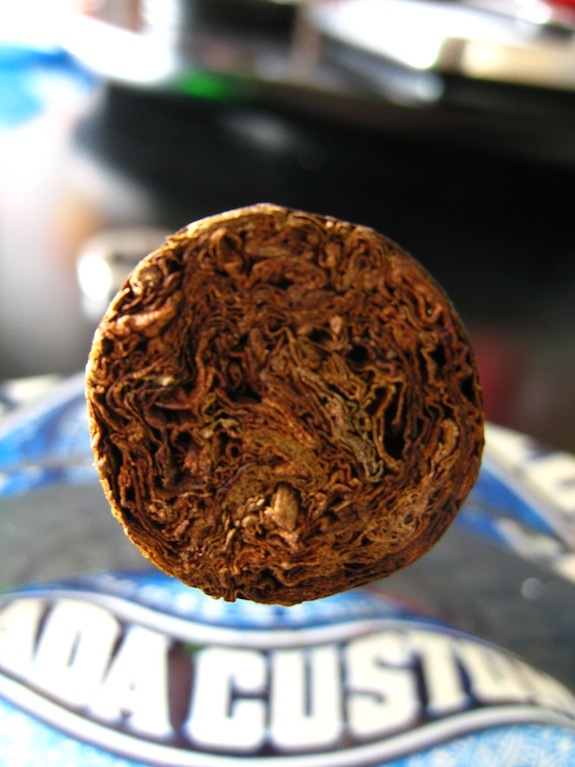 The cigar has quite a few tiny veins that I don’t foresee causing any problems and is topped off by a seamless, round double cap. The band is identical to the beige, gold, and maroon old school style band as the Natural only with the orangish red secondary band branding this cigar as a Maduro. The wrapper gives off almost no scent at all, pretty much the only thing I could pick up was a nutty, tobacco scent. The foot however bursts fourth with cocoa, tobacco, and spice aromas. The Traviata was a little tough to cut using my Palio double bladed cutter. I am really hoping this cigar isn’t packed too tightly. The cold draw seems to be fair and produce a very spicy, woodsy flavor. I’m anxious to fire this guy up. First Smoke: The La Traviata Maduro took almost no effort to light up using my single flame cheapy torch that just happened to be by my back door. To my surprise the draw was effortless and produced a massive mouth full of thick, heavy smoke. There was a bit of spice off the bat, but not nearly as much as I was expecting. Just enough to tease the back of the throat. The main flavor was earthy tobacco with back up notes of soft cinnamon, cocoa, and spice. The retrohale is amazing and primes the nasal passage with a strong cedar coat with pepper afterthoughts. The La Traviata Maduro doesn’t give off much stationary smoke, but what it does give off is a very interesting, great scented cedar aroma. The burnline is excellent and right on target producing a very bright white and grey, tightly compacted path of destruction. The ash itself held on for almost and inch and a half before toppling into my ashtray. Halfway There: Into the second third of this Traviata Maduro I am blown away by how ridiculously smooth this cigar is. I could hit this stick one, after another and never feel any kickback. That being said, I haven’t felt any real presence of nicotine yet. The spice is completely gone at this point and the remaining cedar and cocoa flavors are really taking off. There is a little bit of spice, and earthy tones but that cedar is rocking hard. The burnline is still crisp and clean. If I remember correctly the La Traviata Natural burned very slow. I am not having the same experience with the maduro. Either it seems to be burning a bit faster or I am really enjoying this cigar. I am finding myself not wanting to put it down. Finish: I am honestly that, despite how hard I was going on this cigar that absolutely no harshness built up. The La Traviata finished even smoother than it started. The pepper never did make the comeback, and that’s totally ok. The main finishing flavor was cedar with a bit of coffee backed by bittersweet cocoa and spice. I did however, slightly start to feel a bit of the nicotine kick in towards the end, but not enough to even phase me. I took this bad boy all the way down until my fingers burned. Total smoke time was a little over an hour. 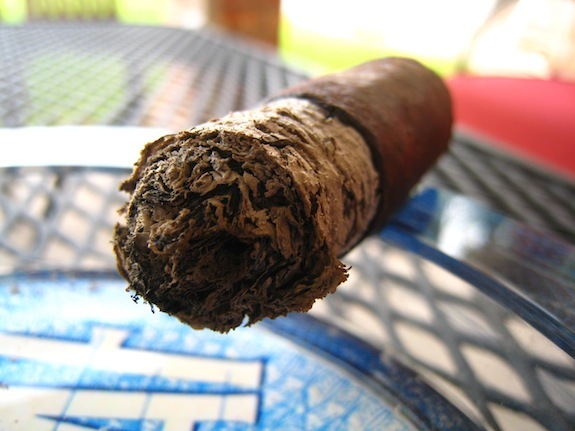 If there is anything a cigar manufacturer can learn from CAO it’s how to apply glue to a band. These two came off with extreme ease. 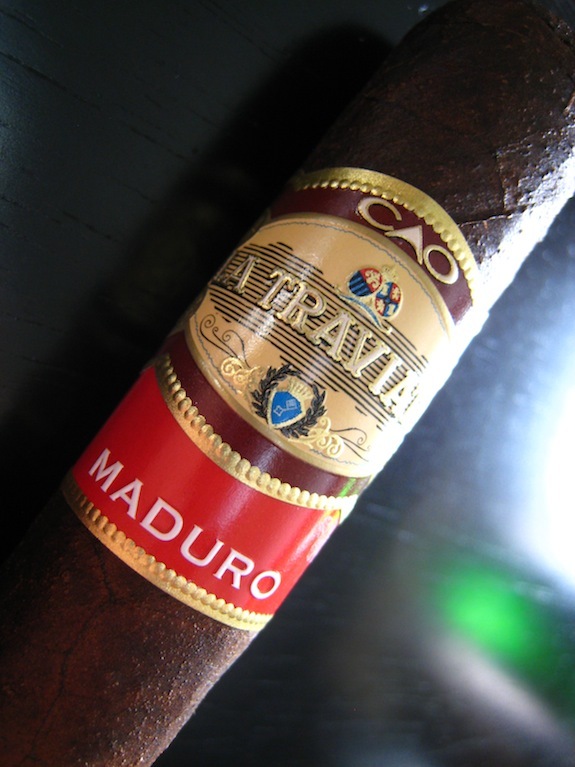 Overview: I think it goes without saying that CAO’s La Traviata Maduro is yet another winner. Box worthy by far and probably one of the best cigars I have had all year. The smoothness is perfect for the most casual cigar smoker while the complexity and absolute top-shelf flavors are enough to please even the biggest critic. At a price point of around $6 a stick this is a perfect cigar for just about everyone, including myself, to have in their regular rotation. 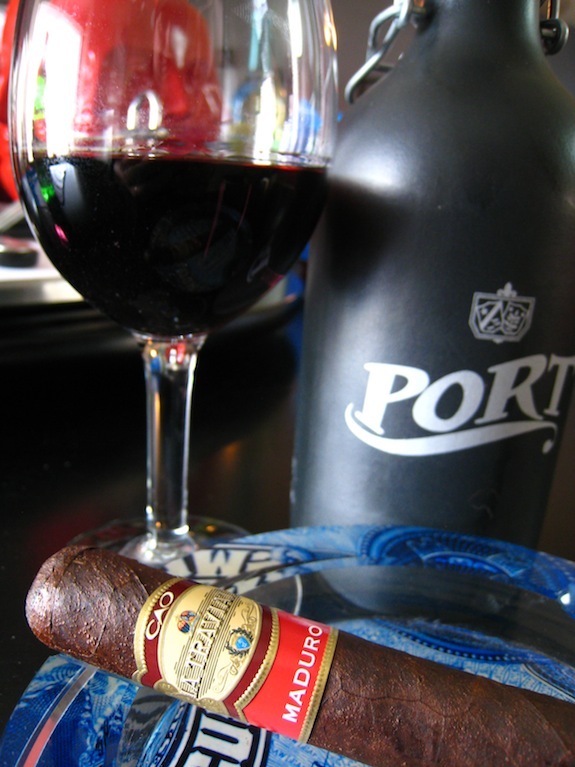 Pairing: Being that I am low on my beer reserve I decided to pair this La Traviata Maduro with some St. Clair Vineyards Port. This port is an award winning, dark red with in your face flavors of plum, black current, and pepper. The port finishes off warm with hints of nutmeg, cinnamon, raspberry, and black cherry. I can’t think of anything that I would have rather paired this cigar with. The fruit made a perfect pair with the smooth cocoa flavors of the cigar. 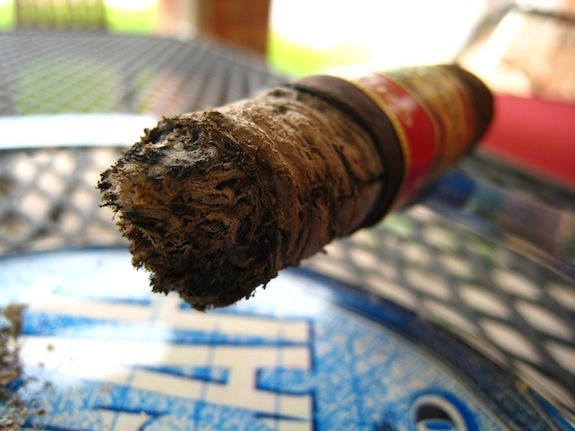 This cigar would pair perfectly with black coffee, stout, porter, tea, or any brown soda. Dear Daniel, I don’t want to hear any crap about my glass. I’ll get a proper one soon! Let me clean the drool off my keyboard… That smoke sounds awesome! For the price, you just can’t beat a La Traviata and now a Maduro wrapper? Just send me a box and be done with it! Jared, he mentioned the burn time to be just over an hour, sounds about right to me. can’t wait to light up one of these bad boys. Good job Tony! A maduro version of the best value smoke I’ve had..maybe ever. Sign me up. Good work my man. It seems you nailed it on this one so….any others you have just send on over to Afghanistan. Oh, and what was the burn time? I smoked my first one of these last night and I’ve got to say, your review is dead on. What a great smoke! You cool if we link this to our smoke shop website and Fbook page? Jared, yeah a little over an hour. I would estimate it closer to 1.5 hours as I couldn’t put this cigar down. I absolutely loved it. Sadly, after having this one I don’t ever see myself going back to the natural. Jeff, Thanks for the kind words! This was a tough cigar to review as I found myself enjoying it just too much. We would be honored and greatful for the link! Tony, As I told you in the past about La Travieta when i tried at the Big Smoke in Vegas. I though it was one of CAO cigars that I enjoyed the most. I can’t wait to try the maduro now. Does your buddy Adam have these in stock now? Victor, the maduro is in a totally different Ball Park. I really enjoyed the natural but it doesn’t hold a candle to the maduro. Unforunately they aren’t in stock yet. CAO announced that they were shipping early last week. But only a few shops accross the US have actually confirmed receiving the cigars. CAO is usually really good about distrubution so I would expect to see them start landing in local shops anyday now. Great review… I love this smoke & have been rationing the 5 pack I was lucky enough to win from Jon on twitter a while back. There is definitely a box with my name on it as soon as I find them in stock somewhere. And your right…. Its a wrap for the natural…. Way to win a 5-pack of pure awesomeness! Nice review man, I hope to try 1 soon. Why did you give me yours!!! Now I gotta find one for you! Tony great review my man. I can’t wait to get my hands on this cigar huge fan of the regular La Traviata. Well written review. Just had this tasty CAO maduro, and I must agree, unbelievably smooth. I paired it with a 18 year single malt and I must say, it’s truly brings out the flavor and smoothness of both the cigar and scotch. Spot on review for a great cigar. 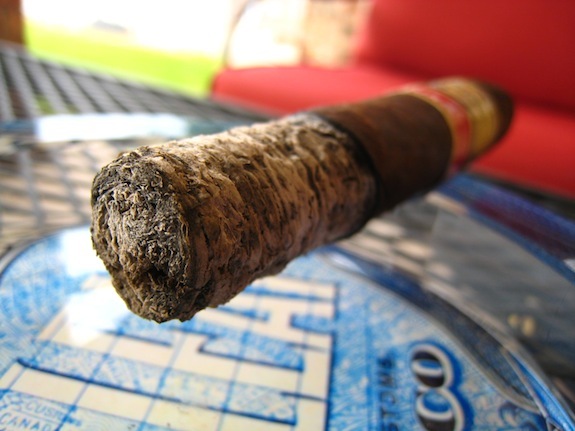 I agree with you in that I much prefer the maduro to the natural. In fact, the only problem I have with this cigar is finding a store that can keep it in stock.